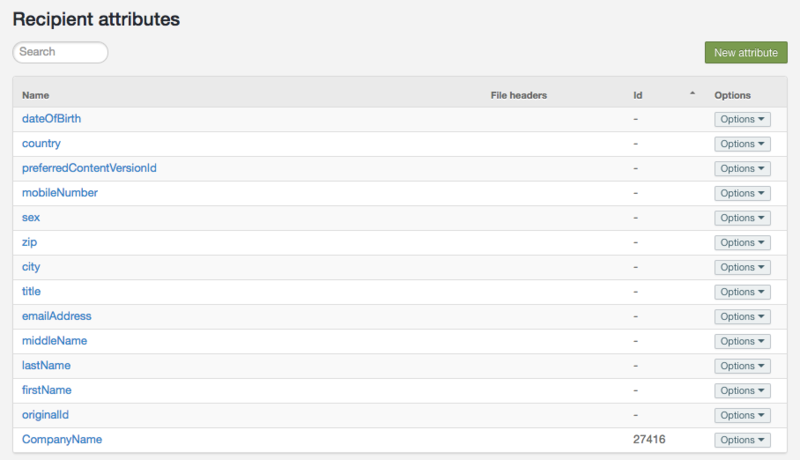 Recipient attributes are the different recipient list field names that you can import file data to. 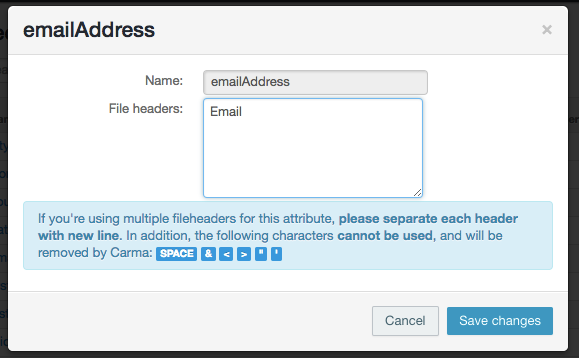 A couple of the recipient attributes is already in Carma when you start your account as default, such as: email address, originalid, first name, last name etc. These are the ones you should use for the corresponding data you have but you are of course welcome to create many more and import other data to. 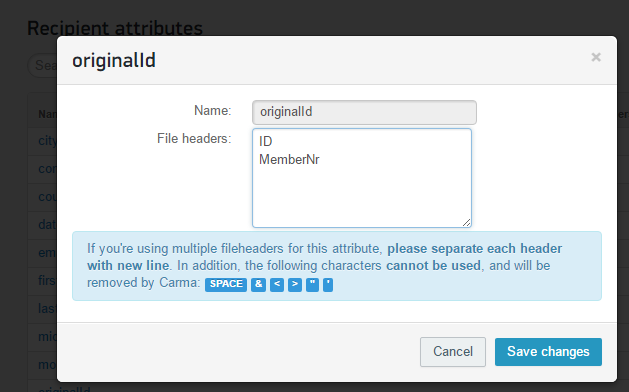 You can easily spot Carmas default attribute because they have no ID number and custom attributes has a number as ID. All the Carma default recipient attributes and the ones you create will appear in the import dialogue so you can map your import file columns to them one by one. Below is an account with all the default recipient attributes plus one created in addition for a company name value. 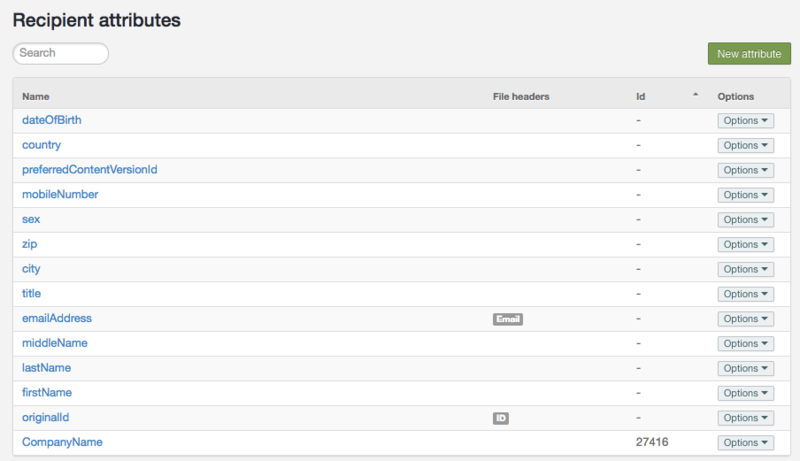 If you have an automatic import from file uploaded to Carma FTP account you can also specify your file header name to the recipient attribute. This way Carma will auto detect which file column it should map to which recipient attribute when the scheduled import starts. PLEASE NOTE: If you DON’T map your ID column in your file to Carmas default attribute “originalId” in a scheduled import, no rows in your file will be imported. When you set up Scheduled imports there is also a functionality that makes Carma automatically generate new attributes from your file headers in case they do not already exist in Carma, or have not been mapped to any existing attribute. So, if your file consists of a couple of brand new column headers, the file column headers will be auto created as new attributes by Carma. Learn more about Magic mapping.